Ah, Iceland. We meet at last. Almost. Books are modes of conveyance, right? My husband has had a thing for Iceland since long before we met; he listened to Sigur Rós before it was everyone’s favorite inspiring music (Glósóli was the first song on the first mix-CD he made for me—yes, you read that right— and would have been our son’s birth song, had it not been for that pesky emergency C-section). He’s wanted to visit for ages, and when I win the lottery, I’m booking us a flight. 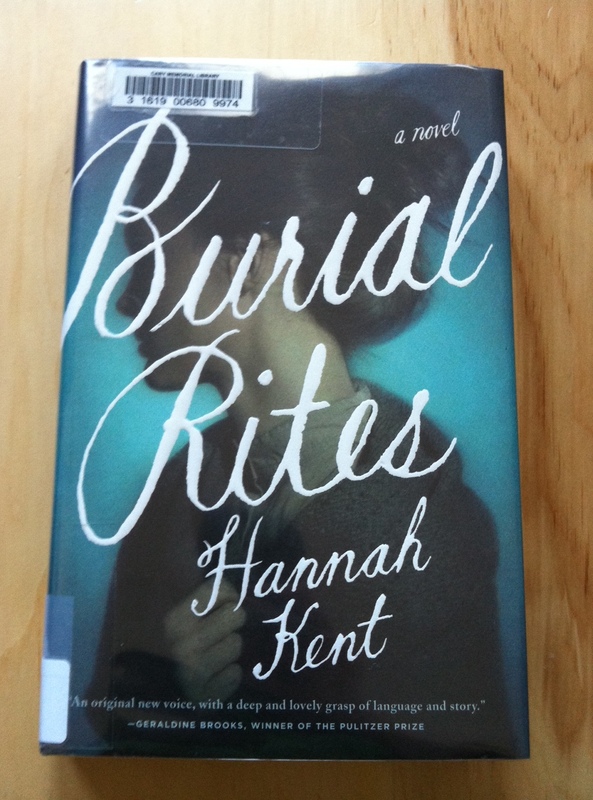 I can’t claim that Iceland holds the same appeal for me as it does for Mr. O, but Hannah Kent’s Burial Rites brings the stark, relentless landscape into such focus that now I’m itching to see the land, the grey sea, and the ice-blue sky. I’m not much for landscapes, as I mentioned when I wrote about Bay of Fires, but this is the second book this year to make me care deeply about its characters’ surroundings. The jacket copy (and Goodreads summary) will tell you right off the bat that this novel is an exploration of the last months of Agnes Magnúsdóttir, the last woman publicly beheaded in Iceland, so I don’t feel too bad about telling you too. Before her execution, she’s placed as a worker-prisoner with an unwilling family for a few months while a priest tries to save her soul; instead, they hear her story. That’s what I like to call a dramatic situation. The action of the novel moves toward the inexorable end with grace and sure footing, even if the same can’t always be said for Agnes. At first I was a little thrown by the unconventional structure (letters and documents interspersed with third-person narration and first-person narration from Agnes’s viewpoint), but by the end of the novel, I loved it. The structure regulated the pacing, and eventually the narratives meld together in perfect synchronization. Not the Shackletonian type of endurance, but the kind of constant scraping by that leaves blisters that never heal. Agnes endures abandonment after abandonment until the warmest home she finds is with her keepers, her best company a nervous priest and a sharp-seeing middle-aged woman who also waits for certain death (that reliable killer of nineteenth-century female characters — tuberculosis) but no execution date. In the world Ms. Kent recreates, even the comparatively well-off in nineteenth-century Iceland are engaged in survival tasks every day. We see Icelandic families collecting dung for fires, slaughtering sheep, knitting clothes, making blood sausage, scavenging a beached whale, gathering in the harvest, trying not to freeze. Agnes remembers feeding tallow candles to children at one farm while she ate boiled leather — because they were starving. Furthermore, people in this story are forced to endure each other. In each household, people sleep all together — masters and servants, parents and children — in one room. Conversations are overheard, stories and gossip spread like an oil slick on the wave. There’s no way to escape, especially in the winter, when the snow closes in. Reading this book made me think how shocking it is that we’ve managed to endure as a species, when for a long time, for many people, even the simplest pleasures were the faintest sparks in an existence spent fighting for physical survival. Wow. Great review. This has been on my TR list, but I didn’t really know what it’s about. Thanks! You’re welcome! I hope you’ll like it 🙂 It makes me want to read Kristin Lavransdatter, which I’ve been putting off . . . This really sounds fascinating – I’m putting it on my TR list. I agree with what you wrote in the end. Sometimes I wonder about my ancestors and wonder what their stories of survival were, for me to be here. I agree with Ariel – great review! This is the second rave review I’ve read in the last week. I was interested in the book before, I really am now. I love the premise of this story, it’s super interesting. Glad you liked it.